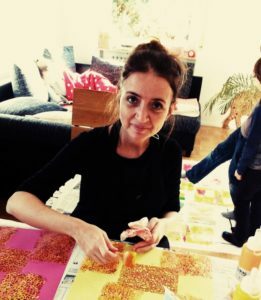 Christiane is a passionate amateur painter with exhibition experience in Germany, France and Spain. Below you will find a selection of her latest paintings. If you are interested in her works or in individual paintings according to your wishes, please don’t hesitate to contact Christiane via info@wila-arts.com. You tell us some colours, possibly also a subject, you would like for your painting(s) and an approximate size. Or you show us a photo of your room where you want to place the picture(s), and we can help you with everything. Think of a diptych or triptych as well. Do you want a canvas or a framed cardboard? We will be able to estimate prizes at that stage. Christiane will create 15-25 drafts for you in the chosen colours in small sizes and send them to you via e-mail. You can choose your picture(s) among the drafts – take your time. This is completely free and not binding – if you don’t like the drafts, Christiane will create different ones for you – if you want. If you have found YOUR picture(s), you give us your order bindingly so that Christiane can start. This will take several weeks. The Customizables are already existing drafts. For the Availables we can inform you about the existing sizes if they are not mentioned here.